Working underground has too many inherent dangers to be adding more due to improper training and health standards. Rely on Sonoma Health and Safety Center in Winnemucca, Nevada, for proven industrial health testing, OT Physicals, Pre-Employment drug testing, Drug Screening DOT, and MSHA mine safety training. 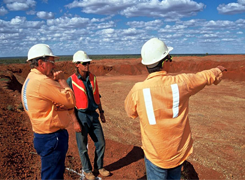 Mining safety for your miners starts with professional training and health assessments conducted by our staff. When your workers leave our sessions, they have a clearer understanding of what it means to be safe during any mining project. For 7 years, Sonoma Health and Safety Center has been digging up better ways for your miners to be safe on the job. We have 36 years of experience to back our services, which contribute to the overall safety and protecting of miners nationwide. Contact us in Winnemucca, Nevada, to request a service from our mining safety experts.